Q. Could you tell me about the journey of the 200-inch Hale telescope lens (the 200" disk) from Corning to Caltech? I am researching the journey of the 200-inch Hale telescope lens from the plant at Corning to Caltech in 1936 (March 26- April 10) by railroad. Image: Disk Hoisted by Crane. Photograph by Ayres A. Stevens, Corning Glass Works. United States, Corning, NY. March 26, 1936. Glass slide: 8 x 10 cm. George V. McCauley Archive, Rakow Research Library, Bib ID: 116511. New York Digital Heritage Collections, ID: 1000093960. Hello! Thank you for your question. The answer I am including here is pieced together from several newspaper accounts that appeared in print between July 7, 1935, and April 11, 1936, of the disk's more than 3,000-mile journey. The July 7, 1935, issue of The Daily Oklahoman defines the problem: "How to pack for shipment across the United States the 20-ton, 200-inch mirror, a piece of glass the size of a fashionable night club dance floor." The Index-Journal of Greenwood, South Carolina, reports on March 10, 1936, about the movement of the disk from the storage building onto a fifty-ton trailer, from which it would be transported to a special rail car: "Railroad officials said two days would be necessary to bolt and brace the 'eye' in place in the well on the special car." 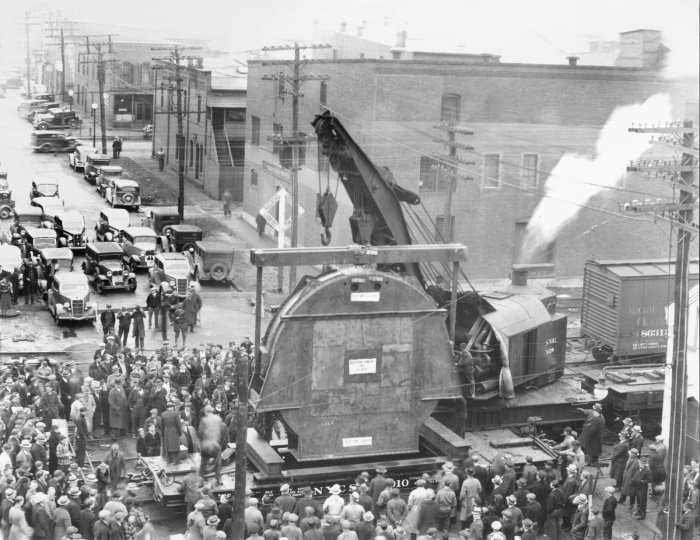 The Decatur Daily Review, on March 11, 1936, explained how the disk was loaded into the rail car: "Standing on edge, the crate containing the mirror was lifted into a hole in the middle of the car.... It was necessary to stand the 200-inch disc on edge to provide clearance for railroad viaducts and overhead bridges." The train was to be comprised of a locomotive, the car with the disk, a boxcar containing equipment needed for unloading, and a caboose. The train was "expected to average between 25 and 30 miles an hour." Another article indicated the speed limit was 25 miles per hour. The route, according to the article in The Decatur Daily Review, would use New York Central tracks to Cleveland, "where a switch will be made to the Cleveland, Chicago and Cincinnati lines. This road will be used to St. Louis, where the train will transfer to the tracks of the Chicago, Burlington and Quincy railroad." The final switch would occur in Kansas City to the Atchison, Topeka and Santa Fe system. The article claims that "it would be necessary to lower the rails in some places to enable the crate to pass under overhead obstructions." Image: Train route (in red) of the 200" disk from Corning to Caltech. A March 27, 1936, article from The Daily Times of New Philadelphia, Ohio, explains, "The disc was encased in an all-steel crate weighing 15 tons. Five layers of heavy felt, three-fourths of an inch thick, protected the rime. The face of the disc was lined with cork three inches thick." The weight of the disk rested "on steel girders between which were layers of cork to protect against shocks." Finally, "Four six-inch axles with cork cushioning through the center of the eye practically held the crate to the car." The Oakland Tribune (California) describes the disk's journey as "more closely guarded than any king on any similar travel." Before the truck could be unloaded at Caltech, workers planned to grease the shop floor "so the truck can be slipped, instead of driven, into position for the final unloading." Dr. John Clyde Hostetter Collection on the 200" Disk, 1934-1943. MS 0072. Corning Glass Works Collection, 1868-2013. MS 0027. George V. McCauley Papers. Bib ID 111096. The archives for Corning Incorporated may have more specific information regarding the trip, security, and logistical matters. I suggest that you contact them as well if your research calls for more specific and verifiable detail. phone (607-438-5300), or text (607-821-4029).